Finally, a meal that Bob and I both liked! You all know that does not happen too often. I made an herb butter using parsley, thyme, rosemary , garlic, fresh lemon juice and some lemon zest. ( I softened the butter first and then added all the ingredients.) I put a cup of white wine in the bottom of a casserole dish. Layered the peeled and deveined shrimp on top. I dotted the butter over the shrimp. Baked it for 12-15 min at 350 degrees. 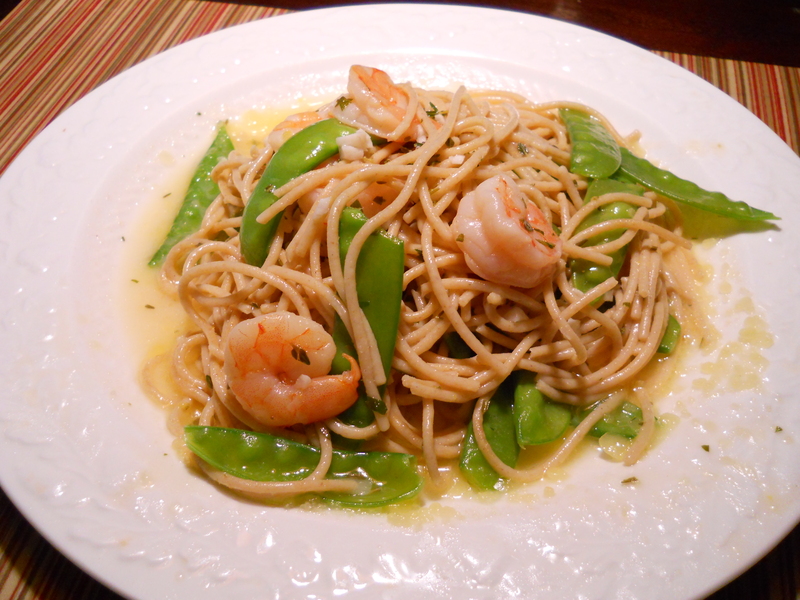 While that was cooking , I blanched some snow peas from the farmers market, and boiled some whole wheat pasta. Tossed it all together when the shrimp was done. The butter sauce over the pasta was quite tasty! This was so easy & a good way to use up extra veggies. Something we can all relate too now!! Yummy! This entry was posted in General on August 13, 2012 by andrewsbeth. Looks so delicious! Love me some shrimp and snow peas! Actually, I stole your herb butter recipe. Just added a few tweeks! Thanks for that! And I meant to tell you, that picture is beautiful!